AEDs are small, lightweight devices that, when used in conjunction with CPR shortly following sudden cardiac arrest, greatly improve a victim’s chances for survival. 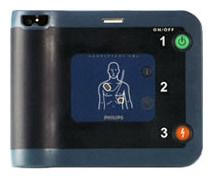 ERT will help you choose the correct AED for your situation (Home, Office, Fitness Center, etc. ), the accessories required (Wall mount vs. Alarmed Cabinet, Adult use or Adult and Child, etc. ), as well as provide the proper training and oversight required. See our “Services” section for details. 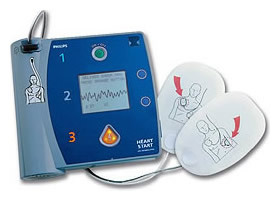 An AED works by detecting when the heart has an abnormal rhythm and, if so, sends an electric shock through the heart; the goal is for the heart to restart into a normal rhythm. When CPR and AED use is started immediately after a sudden cardiac arrest statisics say there is about a 70% chance of survival. Compare that to the average survival rate of less than 5% if you wait for an ambulance to arrive. 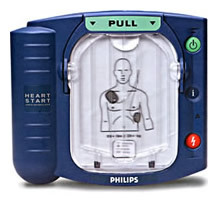 Philips Healthcare, the leader in portable defibrillation technology, designed the HeartStart OnSite Defibrillator for the ordinary person in the extraordinary moment. Available without a prescription, the OnSite is designed to be the easiest-to-use, and most reliable defibrillator available. On the scene with law enforcement, on the field with student athletes or on the job with employees, the Philips HeartStart FRx Defibrillator is designed to be easy to use, rugged and reliable for those who get there first. 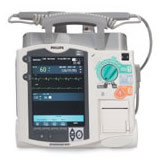 Effective January 1, 2010, Philips Healthcare has discontinued the FR2. For those who still own these units, replacement batteries and pads will be available for the forseeable future. The HeartStart MRx provides EMS responders with the advanced features we require in a logical and intuitive design supporting our need for quick response and access to vital information under challenging circumstances.